If you were wondering what all those fireworks in Greenwich were in aid of last night, rest or not assured you can hear and see them again tonight and tomorrow at 9.15pm down at the Old Royal Naval College. They're part of the 'celebrations' for the "Return of the Tall Ships". More fireworks will be staged in Woolwich over the weekend. 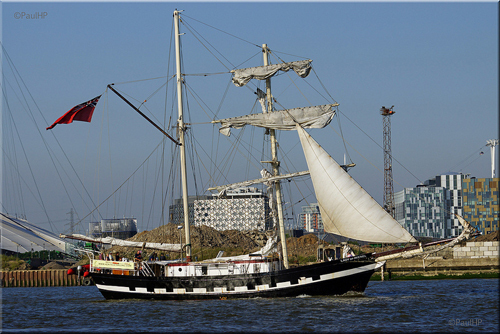 Check the Greenwich Council website for details of day and evening entertainment (+ grand finale on Sunday eve) and the opportunity to tour the boats for free. The main website for the ships is Sail Royal Greenwich which gives the impression it's a corporate jamboree. Tickets are available to the public as well – at 60 quid per adult (there are concessions) for a two and a half hour cruise, but there's a £20 surcharge to take the VIP evening cruise with the fireworks which includes a buffet dinner. The corporate sell on Sail Royal Greenwich makes you wonder where all the money is going... Perhaps to pay for the preservation of these wonderful old ships? A clue comes in the hard-to-find sister website Sail Training International, a registered charity that aims to aid the development and education of young people through the sail training experience, regardless of nationality, culture, religion, gender or social background. 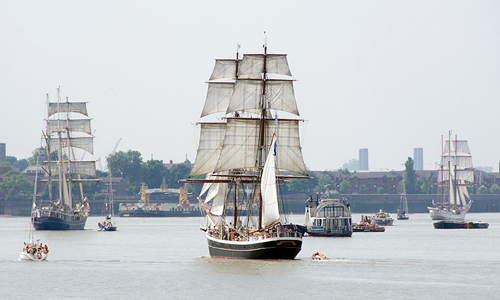 Meanwhile, enjoy the tall ships! And the fireworks! We took a rather more cynical stance when we first posted about the fireworks (we wondered who was paying for them), but then decided to delete our negative comments and leave it to 853blog to dig the dirt. Sure enough, both 853 and Greenwich Phantom have questioned and commented on the role of Greenwich Council in this event. The Phantom also advises a better view of the fireworks from Island Gardens. I've been wondering how the ponds they've installed where market shoppers used to walk would look after the first bit of rain. Of course, it will take a little heavier rain to really bring out its character. And come the first frosts, we'll have our own free ice skating ring. Leave the van - there's nowhere left to park it! A bit of a transportation post for a change. In Lambeth, the council have recently rolled out 40, Dutch made, on-street bike lockers. The lockers offer a secure option for people to park their bike. They can store 6 bicycles, and only take up the space of half a car parking bay. Lewisham Council have expressed a real interest in placing a number of Bikehangars throughout the borough, but they want to find out where they are needed. Do you want a Bikehangar near you? Then let Lewisham Council know where. They are interested in hearing about locations on-street or on private commercial land. Bikehangars are likely to be installed where demand is greatest and your response will help identify possible locations. Please ensure that you reply by the 27th September 2013, when the public consultation is due to close. Do you know anyone else who would like a Bikehangar near them? We would like to hear from them too, so please forward this email to as many Lewisham cyclists as possible. Thank you! Knowing that the editor of this blog has recently had a bike stolen from the estate and having recently recuperated and returned a stolen bike to a Crossfields resident, I know that there may be other people interested in some form of secure outdoor bike locking. I've seen these in Wandsworth and they may be of use to plenty of others on the estate. If you'd like a safe place to lock your bike, use this address to nominate a place (you don't have to be an LCC member to request adequate cycle facilities) click HERE. A couple of old faces on this Deptford Market song - with an in-depth review of Westfield shopping centre at the end. Just a couple of shots around the estate this morning showing how the council contractors and the council use cycle lanes. The van behind is a Lewisham council one. The street is on the borders between Lewisham and Greenwich council. I think that locals have discovered that as it's way beyond either council's range of interest they can simply ignore the road markings. And it's worth betting that they don't even know who's responsible for enforcing no parking. This route is part of the National Cycling Network and has become dangerous for cyclists because, at the Greenwich end, with the vehicles having taken up 2/3rds of the road they then need the other 1/3rd to drive on. Time Out rarely covers South London stories (for instance, Charlton Lido was left out of their recent article on London open air pools), but the anchor graffiti post we blogged at the beginning of August must have caught their eye – plus the previous stories on the Deptford Anchor being removed. The new free Time Out's editorial style is very jaunty and they couldn't resist including as many nautical puns as possible in this piece. You'll be hard put to find a copy of Time Out in Deptford, and the story has failed to make it onto their website, so if you haven't picked up a copy in town, click on the pic above to read. The National Maritime Museum is hosting a day of remembrance on the anniversary of the first successful slave uprising in the western hemisphere (23 August 1791 in Haiti). The day's events will explore the Museum’s collections relating to the trade of enslaved people, as well as focusing on the many local connections to be found in the Greenwich World Heritage Site. Actor and broadcaster Burt Caesar will act as Master of Ceremonies for the day, and will lead the closing ceremony, which will take place by the River Thames at the Water Gates at the Old Royal Naval College at 4.15pm. Participants are invited to scatter rose petals into the river as an act of silent commemoration. Dr Temi Odumosu will explore the themes and attitudes of George Cruickshank’s The New Union Club, which is considered one of the most racist and complex prints of the 19th Century (12.30pm). 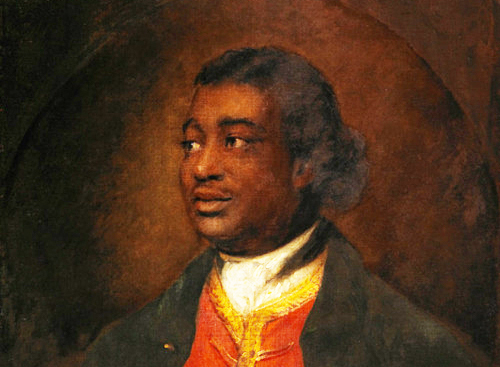 Composer Dominique LeGendre is giving a talk on black composers from the period of enslavement, including celebrated composer and man of letters Ignatius Sancho (pictured above) who lived in Greenwich and was the first black man to vote. There is also an interactive tour for families by storyteller Rich Sylvester exploring Ignatius Sancho's early life (12pm & 3pm), and historian S. I. Martin (author of children's books and the learning manager at the Black Cultural Archive in Kennington) will lead a walking tour to St Alfege Church, Greenwich, looking into the impact that the slave trade had on Greenwich families (starts 2pm at the Museum entrance). 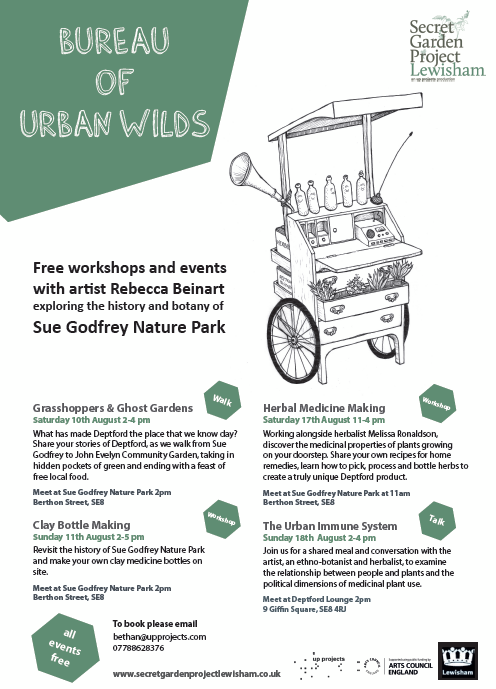 There will also be singing and art workshops during the day (for all ages and abilities). 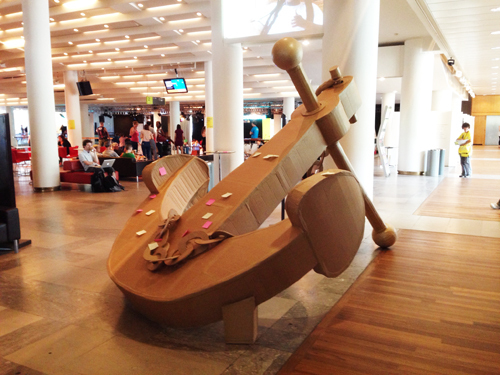 To find out more go to the National Maritime Museum's webpage. Discover what life was like for a Black sailor in Nelson’s navy, through the eyes of John Simmons. From being press-ganged and taken away from his home in Jamaica, the young sailor's moving story reveals the realities and surprising freedoms of a life at sea with Admiral Nelson. Nelson’s Ship in a Bottle, Sammy Ofer Wing entrance, National Maritime Museum. Suitable for ages 7+ More info here. The Greenwich Street Party features the Michael Joyce Charity Drag Race, in which runners don the most outlandish costumes (usually involving impossibly high heels) and sprint around a circuit of Greenwich town centre, all in aid of charity. The Rose and Crown pub will be hosting a Cabaret Stage from 6pm, featuring a host of cabaret drag artistes until 10pm when coaches will be available to take party-goers to the after-party at the George & Dragon. The drag race will start around 7pm from the Rose & Crown. Deptford Anchor: is this the new smiley face? Not your usual anchor, this. It's not part of anchor mythology. It's sort of close to a modern anchor. You may have noticed it has no "arms". In fact it has no "stocks". What ordinary folk might instinctively call 'arms' are called "stocks", and actually the anchor has "arms" but they're the arched bits either side of the bottom of the "shank" – the stem. 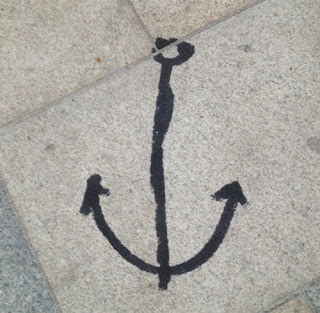 Unsurprisingly, this anchor without stocks is known as 'stockless', and is very different to the anchor we have come to prize as part of Deptford's heritage (a gift from Chatham Dockyard), that stood for 23 years in the place where this graffiti has arrived. The old and classic anchor design was superseded by the 'stockless anchor' in 1821, the first significant departure in anchor design for several centuries. 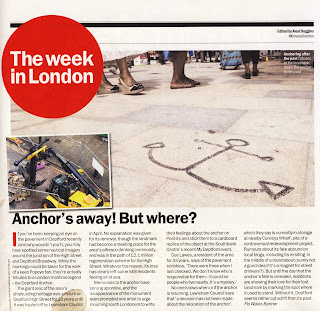 Meanwhile, the Deptford Anchor has disappeared, possibly never to return. Since it was practically the only thing left to remind Deptford of its own history, its absence has been much lamented. 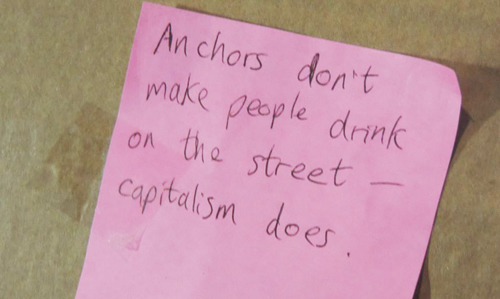 We particularly enjoyed Laura X Carlé's reconstruction of it at the recent Festival of Neighbourhood at the South Bank last weekend (see the Deptford Dame's report)...The artist invited visitors to write their feelings about the Deptford anchor on post-it notes, and by the end of the weekend, the sculpture was covered in coloured notes. If the anchor stayed on the Convoys Wharf site, it would surely look small next to the new buildings that are proposed: the main tower being 48 storeys, the others 38 storeys and most other buildings 12 storeys. Most buildings in Deptford High Street are 2-3 storeys. It's a human level. Double click this diagram to get an idea of how inhuman you can get.. Thanks to Paul for tip off, and to David for first and last photos.